Paul Tillich, more than any other theologian of the twentieth century, maintained an energetic dialogue with psychology, and espe-cially psychotherapy. This book explores what Tillich’s theology has to offer psychologists and others working in the field of mental health, spiritual development, and pastoral counseling. Tillich’s inter-action with Carl Rogers, Erich Fromm, Rollo May, and other famous psychologists became an important part of his thinking. Tillich frequently pushed psychologists to see the underlying philosophical assumptions of their work. This investigation of the underpinnings of psychotherapy then encouraged psychotherapists to become more aware of the ultimate questions about meaning, purpose, and ethics that informed their work. Perhaps the greatest contribution this book offers is a careful narra-tive and analysis of the meetings of the New York Psychology Group, which involved such figures as Tillich, Fromm, May, Rogers, Seward Hiltner, Ruth Benedict, and David Roberts, to name just a few. This important group, which met from 1941 to 1945, dealt with issues that are very much with us today, such as whether faith can be psychologi-cally explained, the meaning of transcendence, the relationship between psychotherapy and ethics, the appropriateness of self-love, and whether human love is parallel with Divine love. 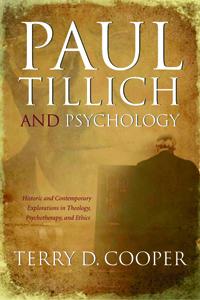 Paul Tillich and Psychology then concludes with an update of Tillich’s influence on the current dialogue in theology and psychology. Listing several of Tillich’s important contributions to psychology, the book suggests that Tillich’s impact is far from over and that it will continue on into the twenty-first century.